With the holiday season upon us, we’re excited to introduce Artistic License. Founder Bonnie Schwartz has been a Timber Lake Camp mom for more than ten years. Her sons Scott and Marc were campers until they graduated – and this past summer Marc (now back as a counselor) served as the Color War general. Bonnie, who has always had an artistic flair, started her own company for which she creates art from license plates. Each picture that Bonnie creates has its own history and tells its own story. 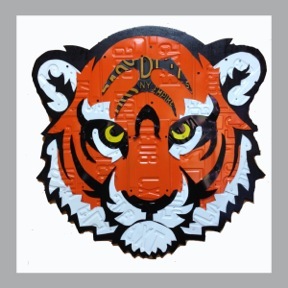 She has created customized logos of prominent celebrities, sports teams, university mascots, comic book heroes, automotive motifs and most recently has figured out how to capture any portrait. In fact, Bonnie’s first two camp logos pieces art were made for Tyler Hill & Timber Lake. 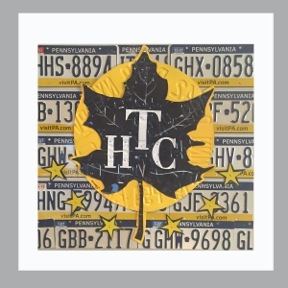 You will be amazed at what Bonnie can create with license plates. If you’re looking for a truly unique holiday gift, not to mention an extraordinary piece of art, check out Bonnie’s website by clicking HERE. She can do anything custom and is a pleasure to work with. You’ll be thrilled with your results AND you’ll be connecting to a long-time member of our TLC Family of Camps! Bonnie has something for everyone; Her work is more than simply a conversation piece. Like any great piece of art, it defines the room that it graces.